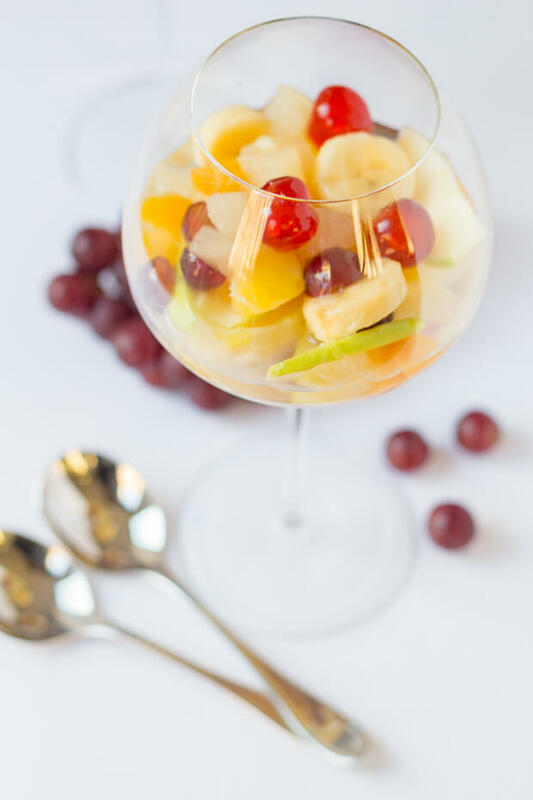 Boozy fruit salad is sure to add a little extra spice to that special occasion. This simple but delicious fruit salad has a secret ingredient in the syrup which makes the fruit sing! 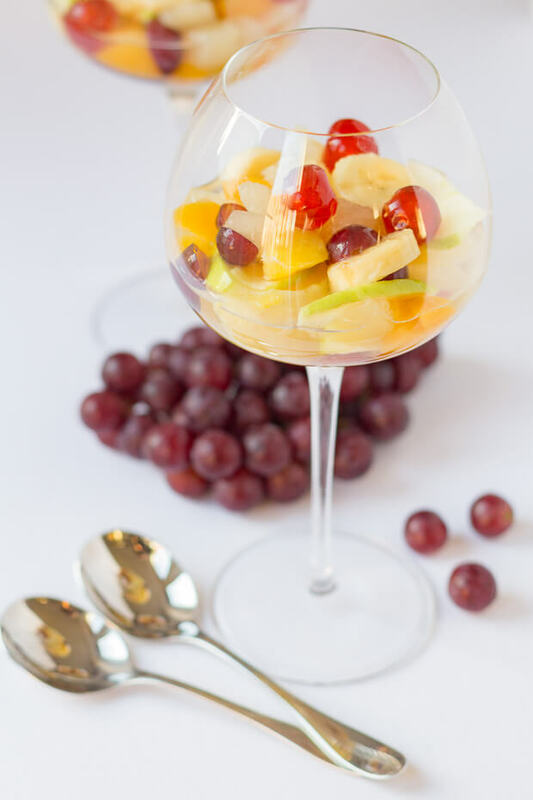 If you’re looking for a “lighter” dessert for your dinner party or special occasion, but one that still has a little special something then look no further than this boozy fruit salad! You’ll be amazed at just how much flavour you can extract from some basic pieces of fruit and a can of fruit cocktail. Then of course there’s the sherry, that little “special something”. Just a little added though, that’s all that’s needed to sweeten up the syrup without overpowering the whole dish. Of course, you can add whatever fruit you like. For example chopped strawberries would make a delightful summer addition. I like this combination because of the beautiful colours and ease to put together. I recommend making this boozy fruit salad either the night before or the morning of the day you’re going to serve it. That way you give the fruit long enough to marinate in the syrup. I’ve served the fruit salad with vanilla ice cream before, in fact that’s how I’ll be serving it this Christmas day! This boozy fruit salad with vanilla ice cream or a slice of the no bake chocolate orange cheesecake are both on the menu as dessert choices. I only hope my parents aren’t reading this so that it’s still a surprise! Actually I think they’ll struggle to decide which dessert to go for as I’ve made this one for them before and they loved it. But they also love my cheesecakes! 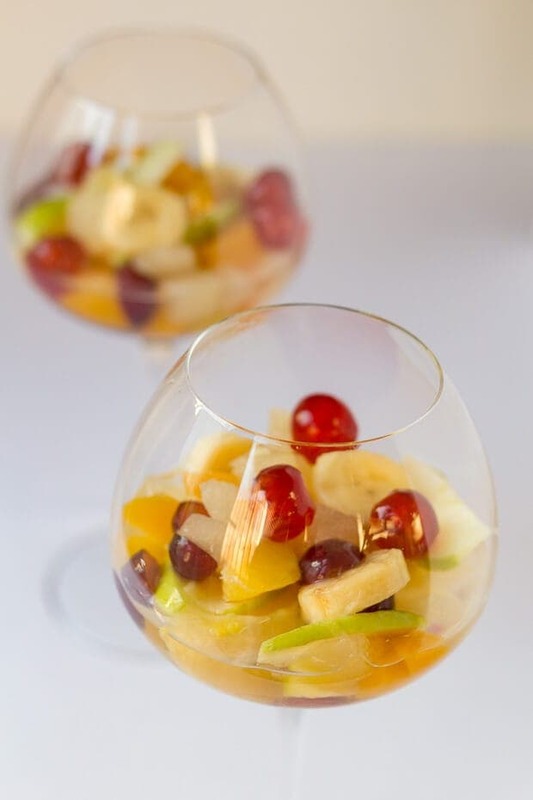 It may be that we have the boozy fruit salad as a first dessert after we’ve had our Christmas lunch because its not too heavy, and then later in the evening we have the cheesecake as a second whilst lazing about in front of the TV. What Fruits Can You Put In Your Boozy Fruit Salad? Sliced apple, chopped peach, chopped strawberry, blueberries and cherries. Sliced apple, chopped banana, seedless green grapes and a can of drained mandarin oranges. Chopped pineapple, chopped mango, chopped banana, chopped strawberries. Really it’s entirely up to you what combination of fruits you put into your own boozy fruit salad. Just try them all out and make it your own. Put water with the cinnamon stick into a pan. Place the pan on stove and gently heat the mixture until it’s simmering then stir in the sugar until its dissolved. Continue stirring until the liquid resembles a syrup consistency. Remove from heat, add the syrup (don’t throw out the fruit!) from tinned fruit cocktail. Strain this liquid, remove and discard cinnamon stick and allow to cool. Then pour into a glass serving bowl. Add tinned fruit, lemon juice, sherry, sliced apple, orange segments, sliced banana and halved grapes to the liquid. Cover and store in the fridge until required for serving. I recommend making this a few hours before required so the fruit has long enough time to marinate in the syrup. 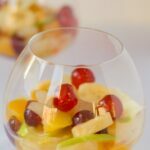 Well folks, I’m pretty sure that you’ll love this simple boozy fruit salad recipe. When you make it, let me know what you think in the comments below! So, we’ve just one more recipe to go on Neil’s Healthy Meals before Christmas. On Thursday I’ll be bringing you a fantastic seasonal creamy cauliflower and cumin soup recipe. One that will go perfectly as a starter to your Christmas Day feast or as a supper on Christmas Eve if you’re heading out. Thanks for spending your time here with me today and I hope you’ll do the same too on Thursday! 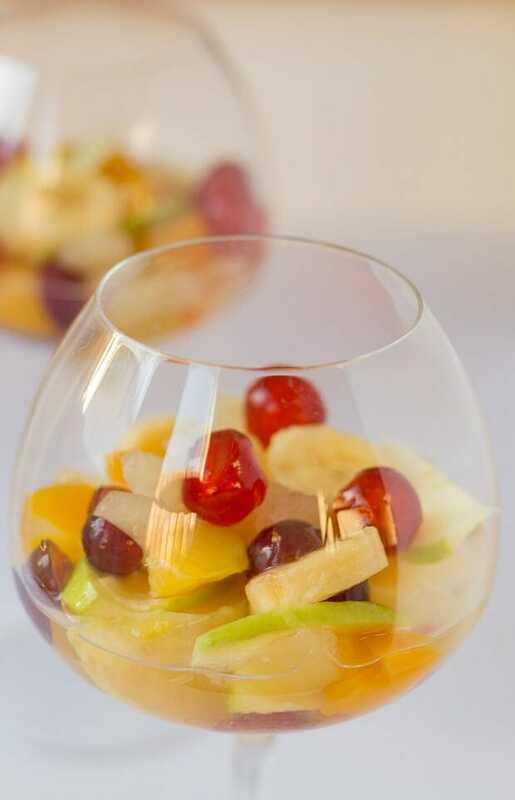 We all need some BOOZE during this time of year – why not pretend to eat fruit salad…. While you get DRUNK!? LOL! Then, as you say, later we will be feasting on that cheesecake I mentioned and plenty of other things too because we’ll have the space to do so! Haha! I totally agree with your thoughts about two desserts on Christmas Day! 🙂 I love just spending the whole day hanging out with family and eating delicious food. Speaking of delicious, this fruit salad sounds amazing. That marinade sounds like something I want to pour into a cocktail glass and sip on by the fire…haha! And serving this with vanilla ice cream? Yes, please! You beat me there David by having a fire to sit beside. My brother has a fire and it definitely adds to that proper Christmas feeling.